Mandie Manzano Jigsaw Puzzle Art is the most unique jigsaw puzzle app ever! Beautiful and truly unique digital paintings! Mandie Manzano’s art looks beautiful on any device! Gorgeous Full Screen Puzzles for All Ages! From 12 to 2000 puzzle pieces! Days of Fun for the Whole Family! 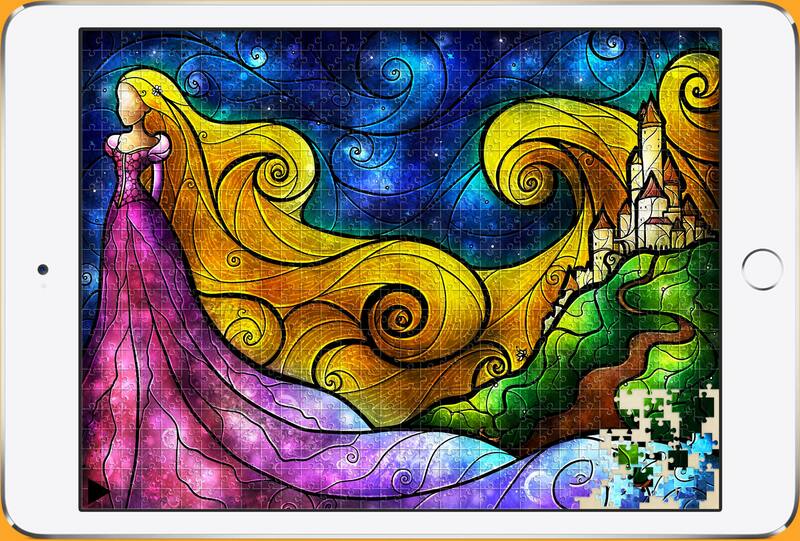 40 gorgeous puzzles with varying piece counts filled with fairy tales, princesses and mermaids! Highly acclaimed art of Mandie Manzano in the App Store for the very first time! Retina sharpness even while zooming! English, Spanish, German, French, Portuguese, Italian, Dutch, Swedish, Danish, Norwegian, and Finnish! The most advanced puzzle mechanics ever with realistic interactive shadows and rotating pieces! Smooth controls and adjustable piece count from 12 to 2000 pieces make it suitable for young kids as well as adults. Pinch-zoomable full screen puzzles effectively utilise 100% of the screen of your device. Examiner Exclusive: Inside ‘Mandie Manzano Jigsaw Puzzle Art’. 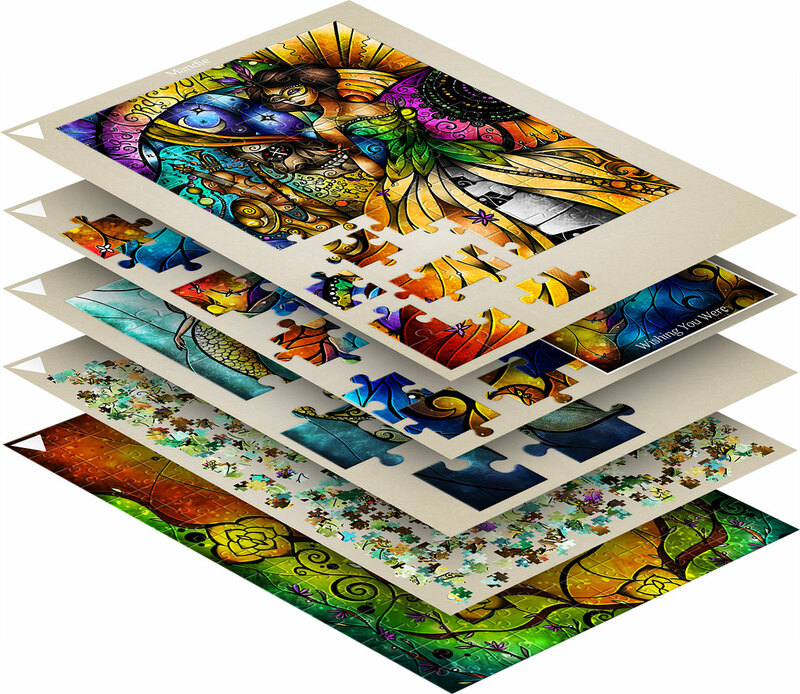 Piece Together Stunning Stained Glass Jigsaw Puzzles in Mandie Manzano Jigsaw Puzzle Art. 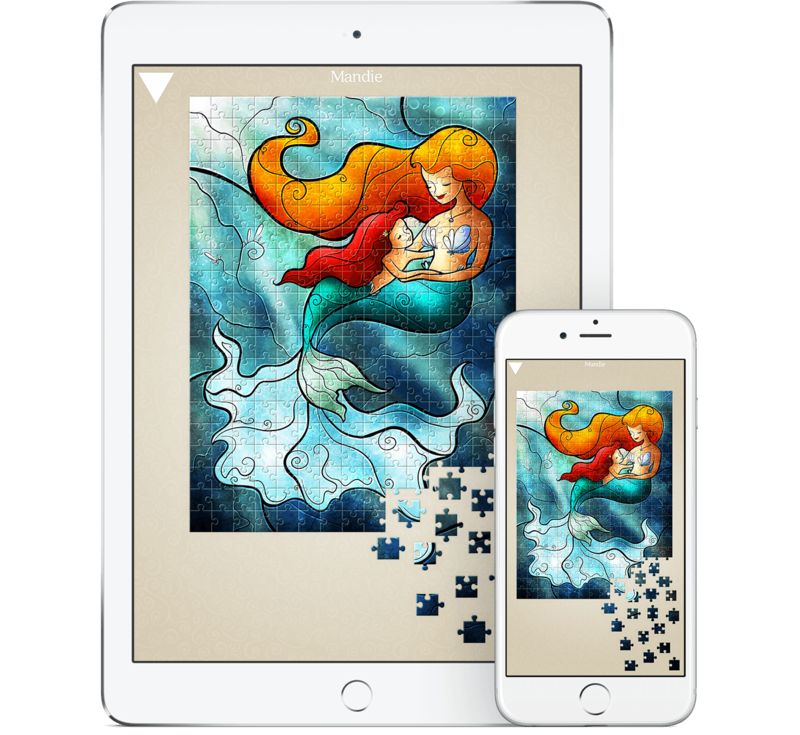 Create masterpieces in Mandie Manzano Jigsaw Puzzle Art! Mandie Manzano art is stained glass come to life. They glow with sun even on cloudy days. Not only is she an incredible artist she’s an amazing person who cares about the people who loves what she does. Mandie’s work is such a light and refreshingly fun take on classic favorites. Working in an industry of artists it’s so nice to see young talent emerging and flourishing that is both accessible and intriguing to collectors of all ages. My entire family loves her work and my girls can’t wait to have their Manzano inspired princess room in the new house we’re building! I can’t wait to see what the future holds for Mandie! Mandie Manzano is one of the most gifted artists I know. She takes traditional stories and characters and makes them come alive in a fresh and magical way. Her style, use of color and dimension is unique and refreshing. I love all of her work and my family does too. Mandie Manzano Jigsaw Puzzle Art Offers a Superb Experience. Featured in the Wednesday release post by Pocket Tactics. Mandie Manzano Jigsaw Puzzle Art Review: Almost Perfect. Mandie Manzano art is one in a million! It’s so unique and beautiful! The stain glass look and beautiful colours bring the scene together to create something magical! Whether it’s fairy tales or one of her custom draws she brings her special touch to each piece! I LOVE Mandie Manzano’s art! Her style is like looking at your favorite characters through stained glass. Her style is creative, inventive, and unique! It takes a lot for me to obsess over digital art but I get so excited every time her name pops up in my feed! Her work is captivating – and now that I have a piece in my collection (a stunning Frozen print!) I am blown away even more! The quality is flawless! A very talented artist and a very sweet person – what’s not to love? I like Ms. Mandie’s art because it reminds me of the sun-catchers I made when I was little, or the stain glass windows in an old church; the pictures are detailed, but they still feel like home. Featured in the Mobile Game Roundup by Adweek’s Social Times. 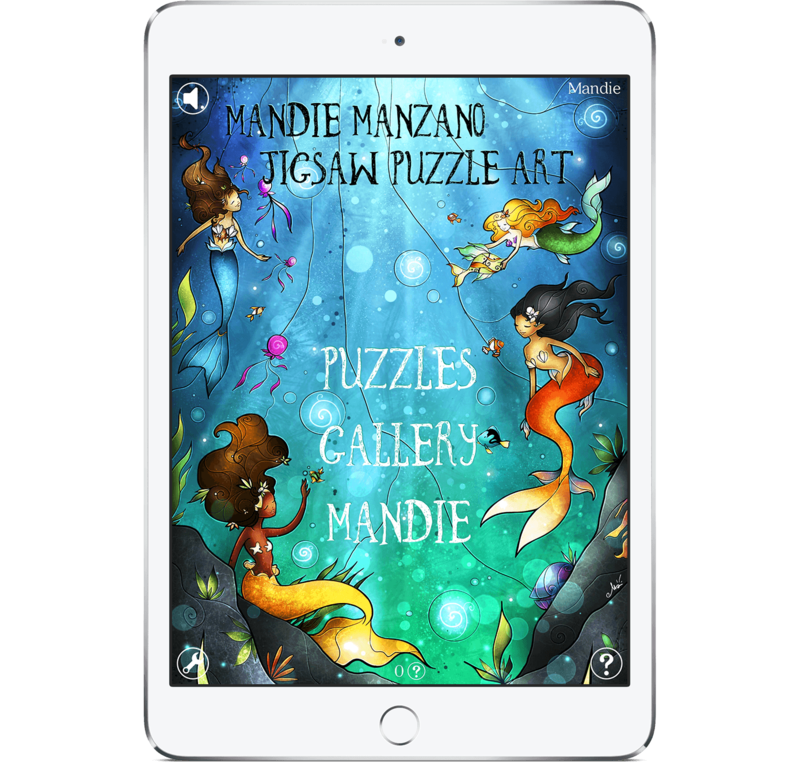 Mandie Manzano Jigsaw Puzzle Art is the best jigsaw game I’ve come across. When I first discovered Mandie’s work I was immediately intrigued by her talent. I am always on the look out for artists who provoke inspiration through their artwork, and she has met that quota by far. Each original piece that she shares as an artist, leaves you wanting more. The playfulness of the characters, combined with her immense talent for hand sketching this unique style is astounding. Her passion for art always shines through each piece. I am truly a fan, and a full supporter to this artist and her amazing creations. Mandie’s art takes you on a fanciful journey through stained glass. Her work is simply beautiful. She is a true talent. I love Mandie Manzano’s art because it’s a beautiful and creative spin on a classic art form! But also the woman behind the art is amazing as well. She holds contests and talks to her fans! I’m proud to have one of her pieces hanging in my room!